The European Union and Bulgaria are at odds over how to spell the word euro. The problem lies with Bulgaria's Cyrillic alphabet, under which the common European currency is spelt "evro" rather than euro. The row threatens to scupper the signing of an EU accord with Balkan state Montenegro, officials say. Bulgarian diplomats said they could only sign the document if euro is spelt correctly in the Bulgarian version of the agreement. The Stabilisation and Association Agreement with Montenegro is due to be signed by EU ambassadors on Monday. "It is regrettable that Bulgaria is prepared to take Montenegro hostage to an unrelated linguistic issue, whatever its domestic importance," said Olli Rehn, European Enlargement Commissioner. Mr Rehn said that a delay would risk the credibility of the accord and could delay similar agreements with other Balkan countries such as Serbia. A spokeswoman for Bulgaria's government said the term "evro" was used in the country's accession treaty to the EU that was ratified by all member states. "This is part of our national identity. We brought the third alphabet into the European Union and it's a matter of respect for linguistic diversity," the Bulgarian spokeswoman said. Bulgaria is the only EU member to widely use the Cyrillic alphabet but it is used in Balkan countries that are lining up to join the EU. 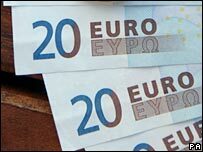 According to the Brussels-based EU Observer website, other countries where the euro is pronounced differently, including Slovenia, have tried to obtain a different spelling of the common currency. However, they have all failed except for Greece. Unlike Slovenia which uses the Latin alphabet, Greece had put forward its different alphabet as an argument - something the Bulgarians are trying to do as well, the EU Observer said. The European Central Bank insists that the name of the common currency must be the same in all the official languages of the EU although the existence of different alphabets should be taken into account.